Laura Livingston ’12, head of our Merchandise Committee reflects on the connections between art, hope and spirit of creation in Haiti, and where VHP fits in the picture. As members of VHP, we become accustomed to working with and getting to know to a variety of Haitian paintings and handicrafts. This artwork gives us a tangible connection to Haiti and reminds us that somewhere beneath, among, or even above the injustices of poverty, natural disasters, and disease there can be an indefatigable willingness to continue, imagine, and create. It is this creation that we are responding to when we “go wow” over a handicraft or secretly covet a painting. During a sale our artwork can be almost overwhelming. You hardly know where to look, and it can be difficult to focus when you are eyeing a paper mache frog while a Pierre Maxo tiger is eyeing your back. However, for all of its engaging power, VHP’s artwork is simply a small point in the Haitian art universe. According to the Haitian embassy’s “Brief History of Haitian Art,” art “blossomed” soon after the 1804 revolution. This art emphasized religion and portraits. Haitian art gained international recognition in the 1930s and 1940s with the creation of the Centre D’Art in Port-Au-Prince. The Centre D’Art was a gathering place for artists, who often also held other roles as voodoo priests and farmers. These artists painted surreal scenes and made patchworks of voodoo flags. The most internationally well-known artist of this time was Hector Hypolite, a former shoemaker and voodoo priest whose paintings featured religious imagery and country scenes. Hypolite’s works are still sought after and considered highly valuable. While the responsibility of the Centre D’Art for the works produced by its artists is disputed, the Centre was among of the first of a series of art schools and institutions (Foyer des Arts Plastiques, Galerie Brochette, and Calfou) that brought Haitian art outside the nation’s borders. 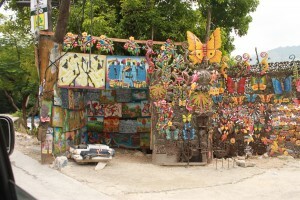 The above paragraph is a short attempt to recognize Haitian art as it exists outside of VHP. Like most histories, the history of Haitian art cannot be contained in a paragraph (or even a blog post). Tidbits of information and stories are sprinkled across the Internet and other sources for the persistent and curious investigator. 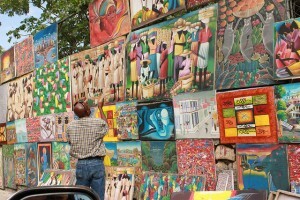 An additional component of Haitian art that ought to be recognized are the informal, street art markets. 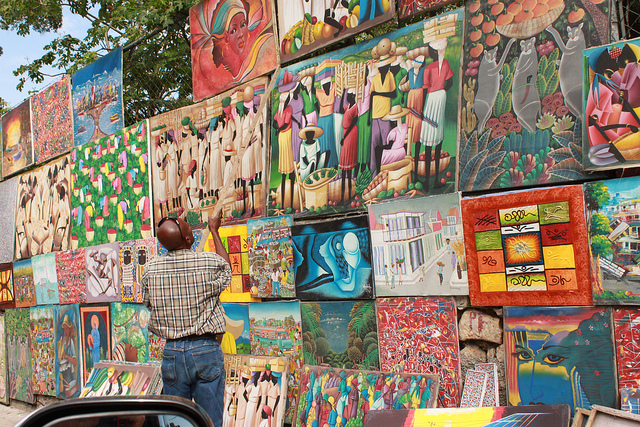 VHP members have visited these art markets during trips to Haiti and enjoyed the diversity of art found there. In addition to increasing my admiration of Haitian art, this brief reflection has made me realize (again) the brilliant idea behind VHP. Somehow, this organization has not only funded education, reforestation, water, and health initiatives in Chermaitre, Haiti, but the source of that funding has come from within Haiti in the form of artwork. It is a neat definition of sustainable development, and one that starts to counter the claim that there is little hope in Haiti. Laura, this post is beautiful! I loved the brief history of Haitian art and the development of Centre D’Art. This definitely puts perspective on the artist biographies I helped collect two years ago for the auction booklet. Laura, this blog post paints a great image of street markets in Haiti. Especially after the earthquake, I can only imagine how the vivid colors and acrylic landscapes bring dead streets to life. I am really interested in finding out how these markets spring in the first place. Are they run by artists themselves or other intermediaries? Priscilla, I don’t know much about the street markets. Perhaps someone who has been to Haiti can tell us more? Very nice to read about the street markets in Haiti. I think it’s great to have a bit of insight about the cultures and street markets in other countries. You definitely made me put the “Street Markets of Hope” on my to visit list!